In every school throughout the nation there are many people involved behind the scenes to make the educational experience a successful one for each student. Everyday children attend school in pursuit of an education that will help them be successful throughout their lives. Who attends to the special needs of our students? Who provides playground and/or lunchroom supervision and all the critical operational duties in the school district? It is the paraprofessionals that fill all of these roles and so many more. The paraprofessionals are educational support staff that provides key services to meet all the needs of our school-aged children. In the Murray County Central School District, our paraprofessionals total 27, 20 at the elementary level and 7 at the high school level. Federal law several years ago expanded the qualifications required to become a paraprofessional, as well as the duties paraprofessionals are permitted to carry out. In general, paraprofessionals work in support of the teacher. Having certified, enthusiastic, well-prepared paraprofessionals can make an enormous difference in the efficiency of a child's classroom and the implementation of a child's Individualized Education Plan. Paraprofessionals can and do wear numerous hats throughout the school day. They work with students with special needs in a small group or one-on-one situations, they assist the classroom teachers with ensuring the needs of the students are met, they supervise the playground during recess, they monitor the cafeteria, they help run the media center, assist in the library, etc. This list could go on and on. One thing is certain; they are necessary for our students and teachers to help ensure learning success. They are also essential to the smooth operation of a school. We certainly do appreciate the work they do, and they support the student population that needs more help to be successful in school. Speaking on behalf of the administration, we are very fortunate to have a talented group that really cares about students. That’s a combination you look for, no matter who works in your school. Paraprofessional Recognition Week in Minnesota is being held January 21-25, 2019. There are over 25,000 paraprofessionals working in Minnesota schools and educational programs. Without these important members of our staffs, the day-to-day operations of our schools would look significantly different. 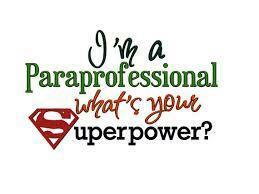 Paraprofessional Recognition Week is January 21-25, but Paraprofessional Appreciation is every day. On behalf of the Administration and Board of Education at Murray County Central Schools, I extend our appreciation for everything that our paraprofessionals do for our schools. We will be celebrating Paraprofessionals Week at MCC with a staff luncheon and certificates of commendation. I ask that you would join us in recognizing the work of our dedicated paraprofessionals and thank them for helping meet the ongoing needs of our students and our system. It is through their support that we are able to continue providing high quality programs and services for all students.